For a comfortable stay in Pokhara Hotel Landmark Pokhara Pvt. 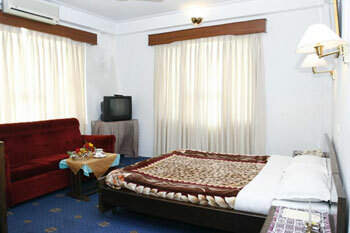 Ltd. is ideal for our valued guests so that they may carry memorable experience of hospitality. When they are back home. Beside in order to live up to Nepal's reputation as the trekker paradise and holiday makers. We have also made arrangements for storage of trekking equipments. With 40 cultural ethnic heritage amenities tastefully furnished deluxe rooms that offers peaceful atmosphere, spectacular mountain views. Rooms with veranda, bath tub, multi channeled remote colour television, IDD telephones, room to room telephone and air conditioned (remote control). The Restaurant serves continental, Chinese, Indian, Mexican, Italian & Nepali cuisines prepared by professional chef. Hotel Landmark Pokhara has one banquet conference halls. With the motto to provide food and beverage facility in the guest room, we have 24hrs room service available. For a menu, please have a look on guest services directory's pages. Rates are subject to 13% Govt. Tax. No charge for children under 12 years on sharing room with their parents.